Watered Properly: This Blc. Ronald Hausermann 'Carl' shows the spectacular results you can achieve if you allow your Cattleya's roots to dry slightly between waterings. It’s a common scenario: you enjoy growing houseplants; you saw an orchid or a picture of one somewhere and you decided to try one out even though you heard they were “hard.” You brought the plant home, gave it all of your tender loving care, and the orchid died anyway. You decide you’re never going to try growing another one of “those things” again. Alas! You’ve deprived yourself of experiencing one of life’s truly rewarding pleasures: watching an orchid you’ve nurtured along finally burst into bloom! Below are two of the most common mistakes new orchid growers make, listed in order of frequency: overwatering, and not giving your plant enough light. If you’ve committed one or both of these “orchid faux pas,” you’re not alone. These mistakes are easy to make and just as easy to avoid once you realize what you’re doing wrong. So don’t give up! Try, try again! Root Rot: The consequences of overwatering. Without healthy roots to absorb water, this Cattleya is starting to look dried out. 1. Premise (A): In old-timey tropical jungle movies, the heroine is overcome by steam and wet heat and she often faints. Premise (B): Orchids are obviously found in the dense, swampy undergrowth of tropical jungles. Therefore, (C): Orchids must thrive in environments where heroic women get overcome by steam and wet heat and faint often. Corollary (D): I must heat and water my orchid to the degree that either I or my significant other faints when we enter the room. Advanced Root Rot: This plant was allowed to sit in water. Repotting in fresh bark as shown here might save it, but a good outcome is doubtful. material. Corollary (D): The orchid I just bought would grow ten times better if I planted it in wet dirt. Acting on either one of these lines of reasoning is lethal to orchids. Act on them both, and you might as well just throw the plant away now. Here’s why: an orchid’s roots are covered by a spongy material that stores water. (Remember, an orchid’s roots need air to grow properly.) Any environment around the plant–sodden bark, swampy mud–that doesn’t allow the spongy material access to some air will quickly rot the roots that the spongy material is protecting. An orchid whose roots are rotting away will begin to wilt and shrivel because it no longer has any means of drawing in moisture. It will look as if it’s drying out. The new orchid grower, watching her plant dry out and shrivel before her very eyes, will water the plant even more, compounding the problem further, killing any roots that were left. Death of the plant quickly follows. 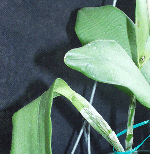 Dry Spell: The accordion-like pleating in this Cattleya leaf shows that it went without water for some time during the leaf's formation before normal watering was resumed. 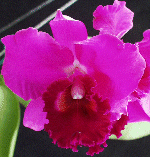 Orchids commonly found for sale grow in the tropics, but not in the dark, steamy undergrowth of swampy jungles. They don’t like the heat: a temperature over 90-95 F is asking for trouble. They grow where strong, diffuse light and the movement of cooler air at night is plentiful, and providing both is essential to growing them successfully. Never pot your orchid in potting soil. Use orchid bark or another type of potting mix designed especially for orchids. Never allow your orchid’s pot to sit in a tray filled with water. If you find your growing medium is consistently wet and your orchid is looking dried out, repot in fresh medium as soon as possible, and cut your watering frequency at least in half to encourage new root growth. Resist the urge to dive for the watering can every time you pass your plant, and you’ll be on the road to orchid-growing success!